Lacquer Lockdown: Hot Off The Stamping Presses: Bundle Monster Sun Kissed Collection Press Release! Hot Off The Stamping Presses: Bundle Monster Sun Kissed Collection Press Release! I have a few updates via press release from Bundle Monster! the ultimate beachy Nail Plate collection for endless possibilities of nail art designs. INTERNATIONAL (August 27, 2014) — From the sandy shores to the deep blue sea, the "Sun Kissed" Nail Plate Collection embodies all things beach oriented. 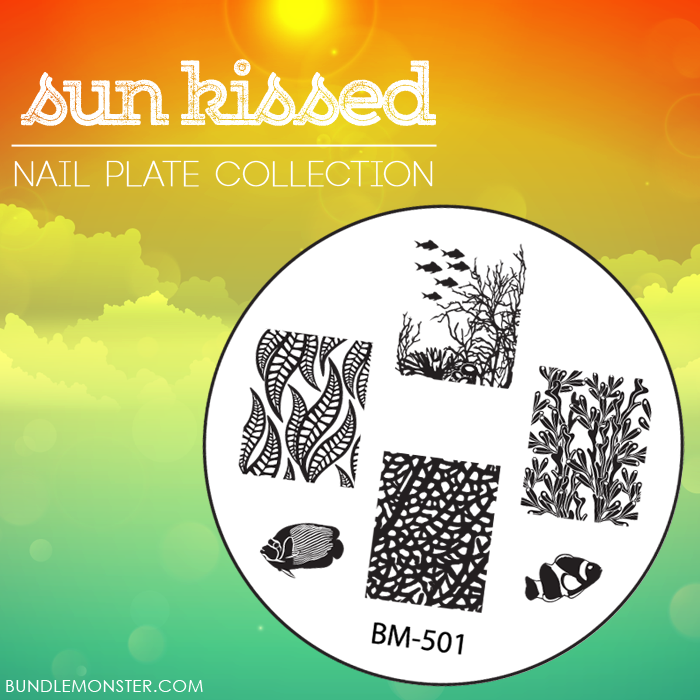 Unlike Bundle Monster's previous nail plate collections, "Sun Kissed" will have a total of 10 nail plates. The change to offer a smaller set was with the mind-set of allowing for more unique, specialty designs. In following with that idea, Bundle Monster's "Sun Kissed" nail plate collection contains an array of refreshing and intricate designs that will delight all fans of nail stamping and nail art. Bundle Monster's "Sun Kissed" Nail Plate Collection is scheduled to be available only on www.BundleMonster.com for purchase near the beginning of September. For more information on Bundle Monster nail plates, nail accessories and products, visit www.BundleMonster.com. About Bundle Monster BundleMonster.com is a beauty and fashion website headquartered in Honolulu, HI that specializes in nail, beauty, and fashion accessories. Bundle Monster products feature the hottest beauty and fashion accessories in the market at the best prices available. Bundle Monster ships to over 50 countries and releases over 150 new products every year. Visit www.bundlemonster.com to shop for your favorite items in beauty, fashion and electronic accessories, where you can get Monster Deals at Angelic Prices™.